Geothermal energy is one of the dark horses of renewable energy. Few “renewable energy advocates” know much—if anything—about it. They don’t know what geothermal contributes today and have no clue what its role could be in a 100% renewable energy future. This is a grave mistake. Where the resource exists—and there’s a lot more of it out there than most people realize—geothermal should be an essential part of the generation mix. I’ve always kept an eye on geothermal’s role in California. In 2016 geothermal produced 12 TWh or 4% of California’s generation. This is nearly as much as the more well known contribution by wind energy. And geothermal has been producing steadily at this level far longer than wind has. Iceland, of course, is famous for geothermal energy, sitting as it does on the Mid-Atlantic Ridge. The island generates one-quarter of its electricity (4 TWh) from geothermal power plants. That’s not the whole story. 85% of homes in Iceland use geothermal heating. All told geothermal provides two-thirds of Iceland’s primary energy. 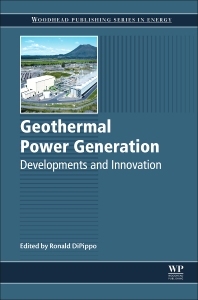 That’s why I was happy to get a copy of Geothermal Power Generation: Developments and Innovation by Ron DiPippo. 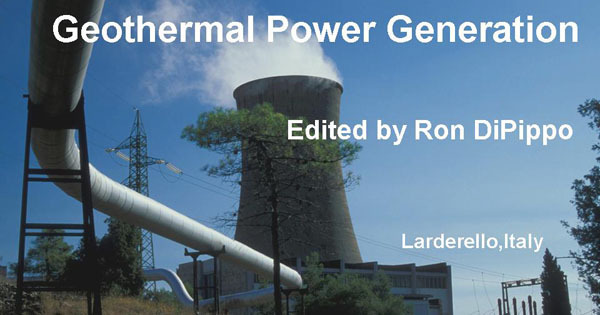 The book is a tour de force for geothermal engineers. DiPippo, Chancellor Professor Emeritus of Mechanical Engineering and the former Associate Dean of Engineering at the University of Massachusetts in Dartmouth, Mass. The 854-page tome is a companion to DiPippo’s previous Geothermal Power Plants, one of the definitive texts on geothermal technology. The new book is a continuation of his work, this time in collaboration with other experts in the field. As a generalist, I found Part Four the most useful. There are eight case studies, beginning with the birthplace of geothermal: Larderello in Tuscany. This is followed by a review of geothermal in California, including the Geysers, a giant field in Northern California. Famous fields in New Zealand, Mexico, Indonesia, and Central America are also covered. I was hooked as soon as I opened up the book to the chapter on Larderello. The subtitle described the history of the “boraciferous region” in what the Italians call the Colline Metallifere between Pisa and Florence. It was here geothermal fluids boiled to the surface carrying solutions of borates. It’s obscure, very obscure, but borates from Tuscany’s geothermal fields are linked to the history of California and specifically the region where I live. Borates are one of the major mineral products of California and the mining for borates—the search for them, and their exploitation--are integral to many famous tales from California’s period of European settlement. Death Valley National Park is a direct result of the borate boom as is the famous 20 mule team wagon trains that carried the borates from Death Valley to Mojave, California. One of the world’s largest borate mines is not far from Mojave—well within view of the thousands of wind turbines that line the Tehachapi Pass. And it was competition from California’s abundant borates that led inexorably to the collapse of Larderello’s borate industry and the rise of geothermal power generation. As the Italians continued to refine their mining of the borate solutions to stay competitive with California, they began drilling deeper and deeper wells. They also began using the hot geothermal fluids for the industrial process of concentrating the borates. Subsequently, they began electrifying the fields and when they could no longer sell the borates they turned to selling the electricity that they generated from geothermal energy. Today, the geothermal plants in and around Larderello generate from 5 TWh to 7 TWh per year for almost 2% of Italy’s total generation. The “Geysers,” as they are called, remain one of the world’s largest geothermal fields. The region in Northern California has been producing electricity from geothermal energy since the 1960s! I’d written about the Geysers long ago—in the mid-1980s. See Geysers Loosing Steam: a Finite Resource After All? At the time the field was in steep decline. As geologist Carl Austin said at the time, there were simply too many “straws in the bottle” for the field to maintain its pressure. The solution was known: reducing the number of wells and the extraction rate. Two authors from California’s geothermal industry describe in this case study how the solutions were eventually implemented and thoroughly document the results. While the field has never recovered its previous glory, the steps taken in the 1990s have arrested its rapid decline. The field’s depletion rate has dropped from a high of 4.8% per year in the 1980s to 2% per year in the 2000s. Nevertheless, steam production has been halved from its peak in the late 1980s, illustrating how much the field had been overdeveloped. The data in this case study is the most succinct and up-to-date I’ve found for production from the Geysers. Companies operating in California are notoriously secretive about their generation. It was a sign of how serious the problem had become that the companies “mining” the geothermal resource in the Geysers had to share data and work together to prevent a complete collapse of the industry—and their costly investments. Though the case study on the Geysers doesn’t disprove whether or not geothermal energy is a finite resource, it does address the question—with 55 years of stats—of how to successfully manage the resource with an eye toward sustainability. DiPippo and his co-authors have produced a comprehensive reference work for those working in the geothermal industry and should be a reference work on the shelf of every environmental organization pursuing a 100% renewable energy supply. Ron DiPippo, editor. Geothermal Power Generation: Developments and Innovation. London: Woodhead Publishing, 2016. 854 pages. ISBN: 9780081003374 cloth. $210.00, ISBN: 9780081003442, epub. $210.00. 9.5 x 6.25 x 1.75 inches. 1.5 lbs. Printed in England.